The IDRC Board of Governors provides leadership and expertise to guide our work around the world. Comprised of Canadians and international members, the Board offers strategic direction, reviews our activities, and approves our budgets. The Government of Canada appoints governors based on their interest and expertise in science, management, and development issues. The chair of the Board of Governors presents an annual report to Parliament through the Minister of International Development. IDRC’s president oversees our day-to-day operations. As the chief executive officer, the president also sits on the Board of Governors. Within IDRC, the Centre Management Committee — composed of senior staff members — supports the president in setting objectives, overseeing programs, and directing staff. We publish an annual report presenting our financial statements and concrete results to Parliament and Canadians. 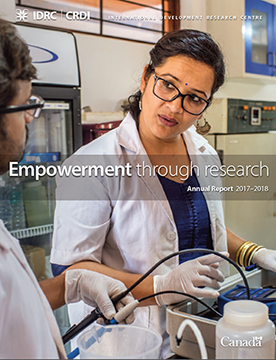 It profiles IDRC-funded researchers, while highlighting our projects and achievements.